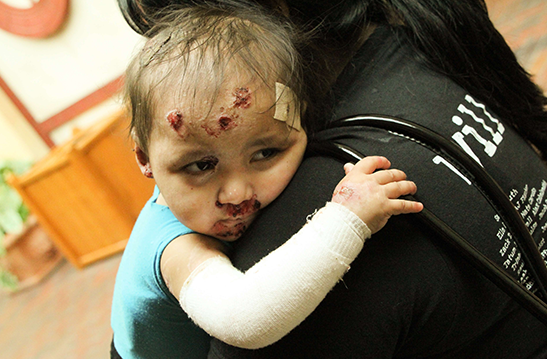 About Epidermolysis Bullosa (EB) — "The Worst Disease You've Never Heard Of." 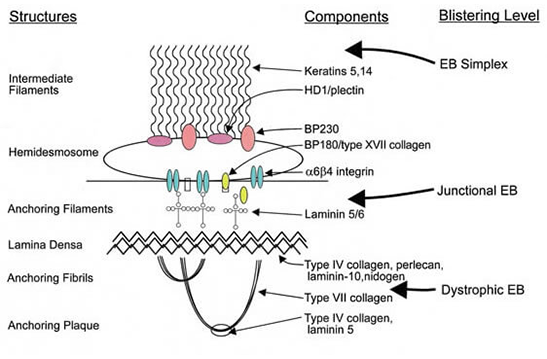 Epidermolysis Bullosa (ep-i-der-mo-lie-sis bu-low-suh), or EB, is a rare genetic connective tissue disorder that affects 1 out of every 20,000 births in the United States (approximately 200 children a year are born with EB). Since EB is a genetic disease, there is currently no cure or treatment for EB. The current standard of care is supportive which includes daily wound care, specialized atraumatic dressings and pain management. There are many genetic and symptomatic variations of EB, but all share the prominent symptom of extremely fragile skin that blisters and tears from minor friction or trauma. Internal organs and bodily systems can also be seriously affected by the disease. EB is always painful, often pervasive and debilitating, and is in some cases lethal during the early stages of life. The disorder occurs in every racial and ethnic group throughout the world and affects both sexes equally. Daily wound care, pain management, and protective bandaging are the only options available for people with EB. For a more in-depth and comprehensive understanding of Epidermolysis Bullosa, please also check out debra of America’s explanation by clicking here. Those born with Epidermolysis Bullosa are often called “Butterfly Children” because as the analogy goes, their skin is as fragile as the wings of a butterfly. While many who live with milder forms of EB can lead long and productive lives, the list of manifestations and secondary complications in the more severe forms is lengthy and requires multiple interventions from a range of medical specialists. Those forms of EB result in disfigurement, disability, and in some cases early death. There is a spectrum of severity, and within each type, one may be either mildly or severely affected. EB ranges from being a minor inconvenience requiring modification of some daily activities to being completely disabling and, in some cases, fatal. Friction causes blister formation. Simply swallowing food or wearing clothing with seams can result in agonizing wounds in the more severe forms of EB. In the most severe forms any epithelial tissue may form a blister secondary to minor trauma. Some examples are the oral mucosa, the external surface of the eye, the respiratory tract as well as the gastrointestinal and genitourinary tracts. In some forms of the disease disfiguring scars and disabling musculoskeletal deformities can occur. Today, three publically traded companies are planning EB clinical research trials, and academic research in the areas of cell, protein replacement, and gene therapy have advanced and are showing great progress. Each day, we are getting closer to finding a treatment and a cure. Until a cure is found, Team Butterfly is dedicated to its mission of providing daily support to those who suffer from Epidermolysis Bullosa.